You can cut through it with a proverbial knife, though, in this case, a scalpel or laser would also be an apt tool. It’s the palpable sense of anticipation for Vassar’s new and upgraded science facilities—what has come to be known as the Integrated Science Center project. Vassar expects to break ground in spring 2013. The Integrated Science Center is one of the top priorities of the Vassar 150: World Changing campaign, which will support, among other endeavors, Vassar’s cutting-edge multidisciplinary studies in the sciences. 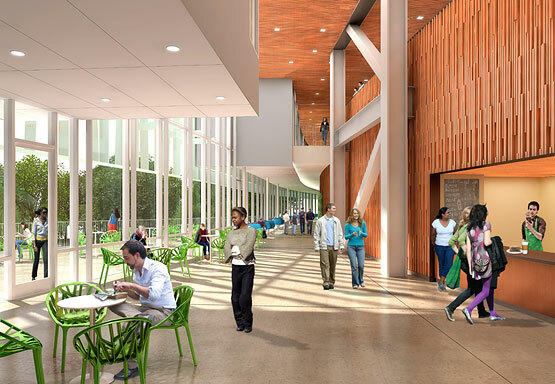 The expansive endeavor will yield a new 80,000-square-foot research and teaching facility (dubbed “the bridge building”); significant upgrades and new purposes for the Olmsted Hall of the Biological Sciences, Sanders Physics, and New England buildings; as well as an ambitious reclamation of the Fonteyn Kill and its adjacent wetlands. “The Integrated Science Center is really going to give us the space we need to do our science in collaboration with our students, which is what we do best,” says Associate Professor of Chemistry Joseph Tanski ’95, who now serves as the faculty coordinator for the science facility project. By that, he means a design that makes sense for both faculty and students. Right now, research projects are literally outgrowing their current facilities, and teams are working in configurations that are not ideal. Architectural rendering of Integrated Science Building view from Raymond Ave. The new lab will include two faculty research labs, a shared teaching lab, a “clean room” for trace metal analysis, a “cold room” large enough to properly store materials and research samples, as well as a joint student-faculty lab intended for flexible use. The Earth and Environment Lab also will provide research space for the college’s Environmental Research Institute (ERI), which supports multidisciplinary faculty and student research, promotes environmental fieldwork by students, and works with the general public on projects addressing local ecosystems. Since 2006 the Institute has closely monitored the Casperkill, which runs through campus, for road salt concentration, levels of nutrients, bacteria, and heavy metals, as well as the state of aquatic organisms and streamside vegetation. In 2010, the ERI co-launched with Cornell Cooperative Extension, Dutchess County, the interactive Dutchess Watersheds website (dutchesswatersheds.org) to educate and link watershed protection groups, municipal officials, students, teachers, and researchers. Meg Ronsheim, an associate professor of biology at Vassar and a conservation biologist, has been one of the most active contributors to the Integrated Science Center planning process. “Having students see that we share facilities across the disciplines is going to send a message about the true nature of science as a collaborative enterprise,” she says. Architectural rendering of Integrated Science Building overhead view. What’s particularly encouraging about the Integrated Science Center is how it will advance the exceptional science already happening at Vassar. Consider as one measure how successfully Vassar professors have secured highly competitive grants from the National Science Foundation (NSF). While the NSF website reports an overall funding rate of 27.5 percent—or 11,000 proposals funded for every 40,000 received—50 percent of the Vassar faculty’s proposals submitted in the most recent 2010-2011 academic funding cycle were approved, improving on the college’s already successful funding rates near or above 40 percent in prior years. Physicist Brian Daly recently obtained a three-year, $214,000 NSF grant supporting research on ultra-thin materials for semiconductor chips and other nanoscale technology. For a sense of how liberating it will be for Daly to have a renovated lab to conduct his ambitious research, imagine the exacting conditions required for such precise work compared to the balancing act he currently performs to maintain adequate lab conditions. These efficient air-handling systems, developed by design firm Ennead Architects, are but one of the environmentally friendly elements of Vassar’s new science facilities. Think of how inefficiently energy is currently used to maintain the lab conditions Daly needs, and then multiply that by the numerous other labs and scientific support facilities due to be updated in the coming years. Architectural rendering of Integrated Science Building from east entrance. Such eco-friendly efforts will move Vassar closer to the Leadership in Energy and Environmental Design (LEED) certification it seeks for New England, Sanders, and the bridge building. There are other environmental factors, as well. When you consider the materials and processes that scientists use in their labs, it’s evident that the demands on air quality are great. In the new bridge building, which will house chemically intensive wet labs, the air-handling systems will focus on maximizing the fresh air inside. Occupancy sensors in the bridge, for example, will guide fine-grained adjustments to the flow of air in labs, so that less air is vented when the labs are unoccupied. The building’s abundant exterior glass will contribute to energy savings by maximizing natural interior light and reducing the need for artificial light in labs and classrooms. [The use of natural light is a key factor in gaining the building LEED architectural certification.] At the same time Ennead has designed a pioneering glass treatment to reduce bird collisions with the building, which will span a wetland that has a considerable avian population. Another sustainability feature that the Ennead design includes, thanks to a faculty suggestion, is a system to reclaim the rainwater from the bridge’s roof into storage tanks, creating a sustainable water source to irrigate the Olmsted greenhouse. Preserving and improving on “great bones” also applies to the natural setting of the new bridge building, especially the Fonteyn Kill and surrounding wetlands. With key assistance from faculty and students, project plans include the restoration of the Edith Roberts Ecological Laboratory, four acres along the stream that faculty member and pioneering botanist Roberts planted beginning in 1919 with 600 species of native plants over 30 years. 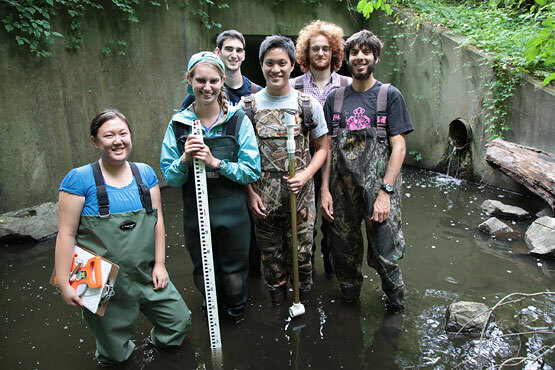 This summer, as part of the annual Undergraduate Research Summer Institute (URSI), students and faculty are at work, often hip wader-deep, in assessing the conditions of the water, vegetation, and wildlife in the area. The researchers will make recommendations on how to preserve and improve the watershed of the Fonteyn Kill, a stream that will run under a portion of the new building. “We want to generate a report that gives us a baseline of the condition of the Fonteyn Kill and the land around it before construction begins,” says Earth Science professor Jeff Walker, one of five faculty members and two research fellows overseeing this summer’s collaborative work. Associate Professor of Biology Marshall Pregnall and biology major Kate Czechowski ’13 have been measuring bacteria levels in the stream several times a week, and typical readings are 7 to 12 times higher than the level deemed safe by the New York State Department of Environmental Conservation. Pregnall and Czechowski say they suspect that leaky sanitary sewer lines in the Town of Poughkeepsie may contaminate the storm water drains that empty into the Fonteyn Kill. Vassar officials are meeting with the Poughkeepsie town engineer to investigate the problem and look for solutions. Professor of Biology Mark Schlessman and Kevin Lee ’14 (a biology major and geography minor) are working at the Fonteyn Kill to catalogue plants that would absorb the runoff of rainwater and pollutants typically carried toward the stream during storms. They will be making recommendations to the landscape architects on what types of vegetation ought to be planted to provide the best protection of the stream. Associate Professor of Biology Meg Ronsheim and Elaine Cheung ’13 have been studying the vegetation that has grown in the Edith Roberts Ecological Laboratory since it was established on the campus nearly 90 years ago. Cheung, with Ronsheim, is drawing up a list of plants they believe ought to be placed near the science center and identifying the existing vegetation that ought to be preserved. This summer, students performed research at the Fonteyn Kill. They will make recommendations for preserving the watershed and limiting the impact of construction. Professor Jeff Walker, Matt Zeltzer ’13, and Patrick Donohue ’13 are examining soils in and near the water to identify heavy metals and other contaminants that may be harming the stream and also using maps and aerial photographs to identify the boundaries of the Fonteyn Kill watershed. Since birds can be used as a barometer of the ecological health of the watershed, Associate Professor of Geography Mary Ann Cunningham and Sasha Brown ’13 are compiling a log of bird sightings in the Fonteyn Kill watershed and determining what kinds of trees and other vegetation various species of birds prefer. The URSI students, who will present their findings at their annual symposium on October 3, say they are excited to be a part of a project that will have an impact on the campus for years to come. Czechowski says, “It will be gratifying if [Vassar and the science center architects and contractors] take our data into consideration as the work goes forward.” Even though the students involved in the project will have graduated by the time the science center opens, she believes the campus will be a better place because of the work she and her fellow researchers are doing. “This is something that will have lasting value for Vassar,” she says. This story original appeared in the Spring/Summer 2012 issue of Vassar, the Alumnae/i Quarterly. Larry Hertz contributed to this story.